This 'oh so clever' shower favor is super fun, yet practical. 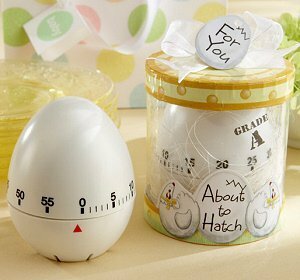 We've taken a standard egg-shaped kitchen timer and put it in a specially designed 'About To Hatch' gift box. 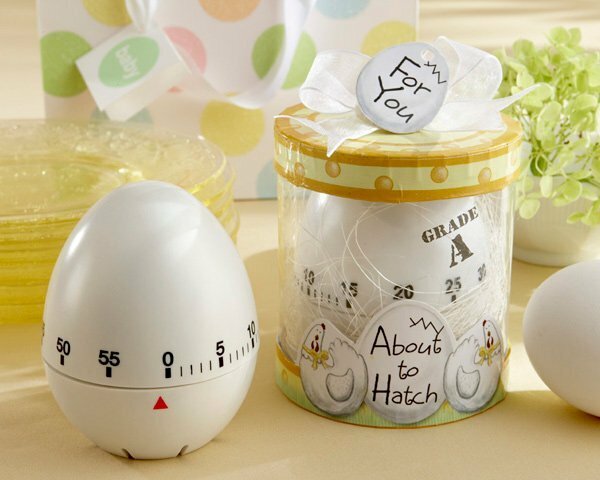 The 3" x 3" gift box features a cute hen design, a grade A sticker, and a beautiful white ribbon that has a matching egg-shaped 'For You' hang tag. Your shower guests will be practically clucking with happiness. Timer twists to count down anything from 0 to 60 minutes.